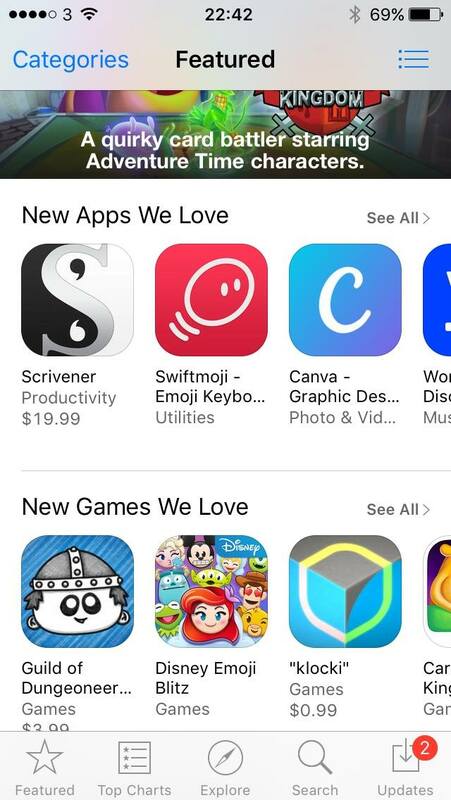 Congrats on the launch and on getting to top sellers. I can't wait for some actual free time to try the game out. Agree with you on those points. To cancel placing a card just drop it in any invalid spot and it will snap back into your hand. I know but at times I accidentally dropped it into wrong spot and wasted the card, especially with the monster cards. I tried to bring them back to the border but instead released them into the rooms next to the border. And about the pace of the game; most of the time it's quite relaxing to play with all the cool animations etc. But when you die a lot and start raging it becomes a problem. That being said, it would be great if I could toggle some kind of 'fast mode' on/off at settings. Or you could make it easier to skip these animations/transitions or whatever they are called. And that currently is my biggest beef with the game. "I will place that pouch here... or... no, better place it back. Wait. Where did it go?" just read through the whole post. there was a lot of really great info in there. Thanks! Wow thanks for the ama on reddit, it's really interesting! According to Steamspy you're over 10k sales, congrats man! I believe SteamSpy stats aren't nearly as accurate till you past X thousand sales, I'd assume they've moved 20-25k+ copies after Top 10 all day. But I'm just speculating. Amazing launch guys. Congrats on the success and very appreciative of how transparent you guys have been on a wide variety of topics since launch. Looking forward to reading all the articles that will spawn from your successful launch. Yeah I think steamspy needs a few more days of data to get it right. We're higher than it says right now by a decent margin. Will be sharing sales stats in the future alright! Congrats on the launch, looks like a success. Hearin' nothin but good things! So, so sorry for abandoning this wonderful devlog right after we launched. I was pretty overwhelmed with just dealing with our release and everything we've been working on since then. I've been meaning to get back in here for months now. This thread was one of my favourite things about developing the game in the open (been posting builds here since Oct 2013). So, I'm going to start writing up a few things here that will eventually make it into a bigger postmortem-style article. If anyone is curious about some facet of our release, development, or post-release workings please ask away! Streamers, how important are they? One side of our release that really amazed me was the amount of attention we got from streamers both live on Twitch and pre-recorded on Youtube. I knew by 2014 that this side of gaming was massive and probably even more important than mainstream press and traditional games criticism to the success of your average indie game. So we spent a lot of effort in attracting them, alongside the more usual press outreach. Doing a big event like PAX well can get you a lot of attention. Versus Evil did a great job here, and from our very first event at PAX South things really picked up. I wrote a big blog post talking about PAX South specifically so check that out for more info. 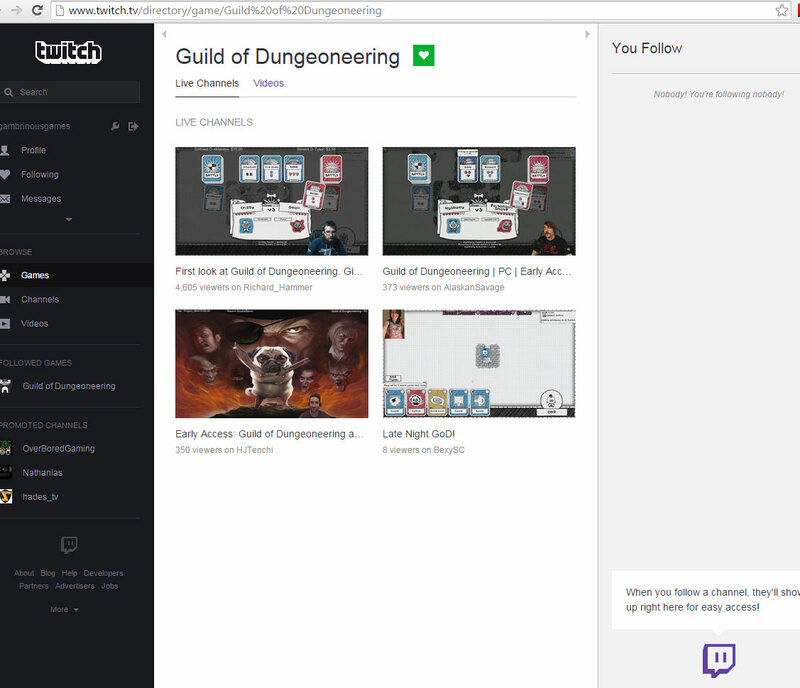 In terms of streamers PAX South is where Jesse Cox and Dodger played Guild of Dungeoneering for the first time. I believe they were just wandering past and were attracted by the name / logo / crowds. They hadn't heard of it before anyway. It's definitely the kind of game that they both like. 'Discovering' our game here kinda turned them into our champions in their circles. For example that same PAX weekend they were doing their usual podcast with TotalBiscuit and WowCrendor and they brought up GoD. So now we're suddenly on TB's radar. They kept up this championing from then on. For example, at PAX East in Boston in March Dodger came over to our booth with several other streamers that she specifically brought over to make sure they played GoD. One thing you should do if you want the mainstream press to review your game is to send them a 'review copy'. This is your 99%-finished version of the game that you share with them say a month before launch so that they have time to play the game and write a review ready to publish on your launch day (you generally include an embargo asking them not to publish anything til launch day). Even for indies I think this is a good idea. In our case we sent out our review build to press 1 week before launch (we just didn't have it ready before then). What we decided to do for streamers was to send them that same review build the week before launching with permission to stream the game straight away, a week early. This was in contrast to actual reviews, which were embargoed til launch day. This got us a lot of streaming. 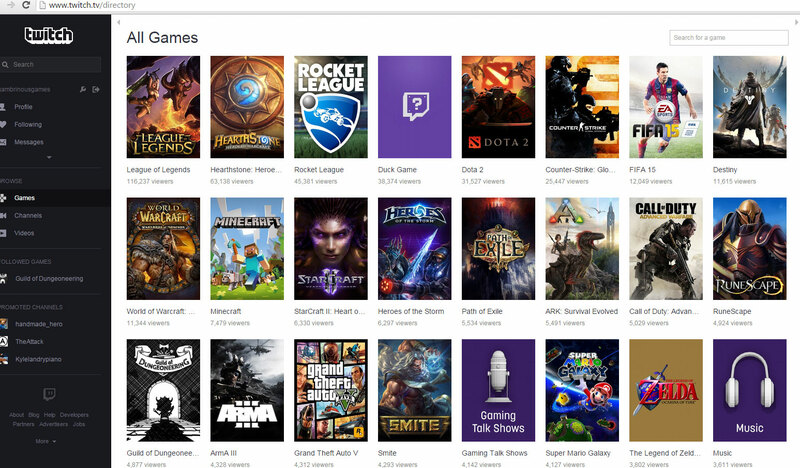 We got a massive amount of folks on Twitch playing the game live during that week. Also a lot of videos on youtube, including some big ones like Jesse Cox & WowCrendor. At this time we were also doing preorders on steam (with a preorder bonus of our first DLC for free, when it came out), and it was translating to sales. 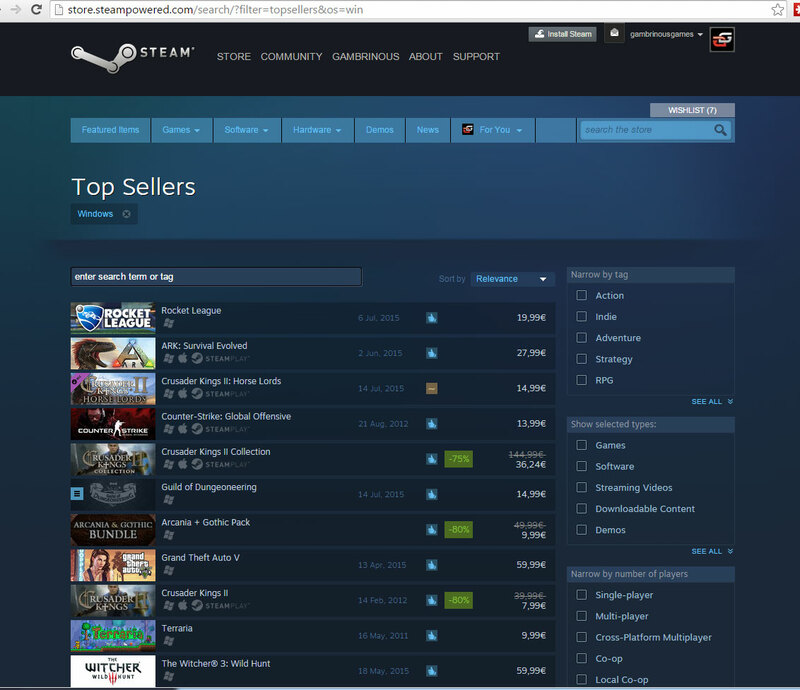 I spotted us at around the #36 mark in the steam top-sellers list a day or two before launch, which was pretty amazing. Folks who bought still had to wait til launch day to play, too. Very interestingly we were brought up on the cooptional podcast again on July 16th, two days after our launch. Have a look at the segment here. Jesse Cox is really excited about the game, and both Dodger and Margaret Krohn join in (note: I showed the game to Margaret at GDC in March). TotalBiscuit says he has played the game but found it mind numbing, ouch! By the end the others have convinced him to give it another go. Here's my mom defending me on facebook, ha ha! A side note on getting featured by Steam. Part of the reason for doing preorders and getting streamers playing early was to maximise our chances of being picked by Valve for a frontpage feature (the big one at the top, which is hand curated). Our publisher was talking to their valve contact a lot during this time, pointing out all the attention and how we made the topselling list already. And it worked, we got a frontpage feature by Steam the day BEFORE launch day, and it stayed up there for about a week. This was amazing. On launch day we were in the top 10 selling chart all day, peaking at #6. Take that GTA V and Witcher 3! I think it's interesting just how many things you need to do over a long period of time to end up getting a video from someone with as big a following as totalbiscuit. He's actually posted a video about how he chooses games to feature, and talks about why he picked GoD specifically. Segment here. Really worth a listen if you are making games and wondering how to get them in front of streamers. As he says he installs a lot of games that he then doesn't post a video about. I've been focused on the streamers with big followings above, and we were lucky to get quite a few of them playing GoD. But that is definitely not where this ends. There is a huge amount of streamers playing games to tiny and medium sized audiences. The really big ones tended to do a single one-off video of Guild of Dungeoneering, which was nice and all, but I really liked seeing the smaller channels who did much more in-depth series. I think that kind of exposure is super-valuable for a niche game like our own. Here's two streamers who played through the entire game (and our expansion) over the course of many, many videos: Baertaffy & Kikoskia. 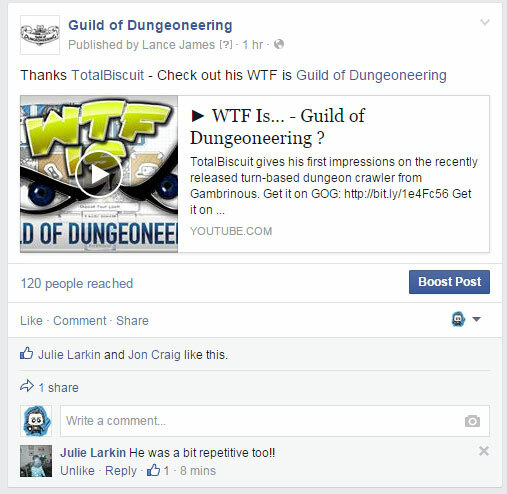 There's over 20,000 videos on youtube about Guild of Dungeoneering now, which is insane. The approach to get on these guys' radars is the same (and smaller/bigger streamers also look at what others are playing, so there's a nice network effect here). One thing I did was I was happy to give out game keys to almost anyone who emailed me to ask, as long as they looked genuine (I did filter out people pretending to be streamers), no matter how small their audience was. Everyone (including myself) starts small after all. We kind of lucked into this, mostly. I didn't particularly design GoD to work especially well for streaming, live audiences, etc. (though I will do for future games, and am doing so for new game modes we are working on). The game DOES work quite well for it though! Even simple things like it being entirely turn-based, with no timers to do anything, ever. You can stop playing to read your chat on twitch, have a discussion about what to do next, etc and that's no problem. Also the roguelite elements are a natural fit for streaming, of course. Stuff like your guys being disposable, loss being frequent, but not game-ending. We did a couple of easy things specifically for streamers though. One was keeping a graveyard showing every single dungeoneer you had lost, with their name and stats etc. I constantly see streamers popping back into the graveyard to see their history. A second thing was letting you rename your characters. When you get a dungeoneer they get a random name but you are immediately prompted to rename them. Streamers love being able to rename ingame characters after people who are watching their stream. Very easy and super fun for everyone! Really love this. Am already a big fan of Felicia Day (particularly 'The Guild'), and it's just wonderful to see them playing the game and laughing with & at each other. Really shows the strengths of the game! That's really really interesting, Colm. Thanks for sharing! Great post, thanks for taking the time. Just a quick note to say the mobile edition is almost ready! We're targeting both tablets and phones for both ios and android. I'm going to run a small closed beta, so if anyone here would like to help out I'd really appreciate it. Guild of Dungeoneering for iOS and Android phones and tablets will be released next Thursday July 14th! By no coincidence the one year anniversary of our PC launch! Ahem. Slight change of plans, we've had to delay launch by a week. New launch date is Thursday July 21st! 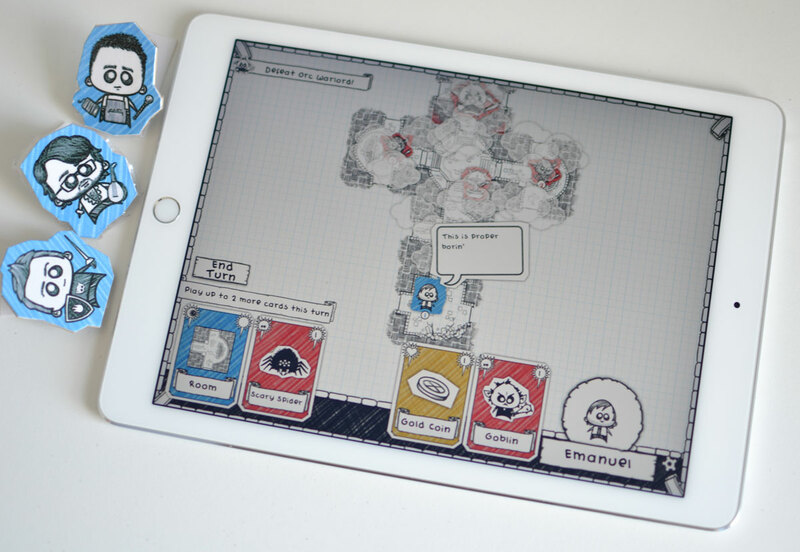 Guild of Dungeoneering is now out on iOS and Android! We've reworked the interface to make sure you have the best possible experience on mobile while keeping everything else that made the game so wonderful on PC: from the singing bard and our hour-long soundtrack to the massive single player campaign. We've priced it for an absolute steal at $3.99 (or international equivalent), and there are no IAPs. In fact, we're going to include expansions as updates to the game instead of selling them (Pirate's Cove will be added soon). When we do that we'll bump up the price slightly for later buyers, so there's a great incentive to buy it now. If you do pick it up it would be wonderful if you could also leave a rating: that helps us out massively right now! Ohh, I love this game. The animation you put into the battles improved a lot the experience from the videos I saw before buying the game. Some battles feel so epic that is incredible to think it's only a card battle. This game looks very interesting. What are you plans to expand the game now that's is launched on all platforms? Right now we're working on a new expansion of similar size and scope as Pirate's Cove, will share more on that soon. We've also got an endless/challenge mode called Trophy Trial that we've been working on for a while. We set it aside to finish mobile edition so can go back to it now. Longer term plans... maybe a board game could be fun? Consoles? Steam workshop? Any suggestions?